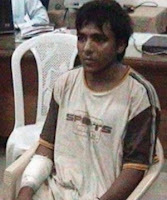 Indian Government announced on Wednesday that Ajmal Kasab man responsible for Mumbai attacks of 2008 was hanged yesterday morning in Pune Jail. Ajmal Kasab is hanged after 4 years of Mumbai attacks. from 2008 some elements are claiming that Ajmal belonged to a village Faridkot while many says Ajmal was not from Faridkot. Recently BBC Urdu team went to Faridkot to find out the truth about it. BBC team contacted different people near the alleged house of Ajmal but all of them said no man with name of Ajmal ever lived here. Then they went to a shop that was with the house of Ajmal on which a old man was sitting. When he was asked about the Ajmal the man replied i am 60 year old and i spent all of my life here. Even if someone keeps Quran on my head i will say that i never seen Ajmal Kasab. Another man named Aslam was also asked about Ajmal Kasab but he replied all these are rumors and there was no Ajmal Kasab living in our village.